The Bridge supports native missionaries through Gospel for Asia. These frontline evangelists, Bible women, and church planters are fully qualified and carefully chosen with the help of godly, Bible-believing native mission leaders. Their work is totally indigenous and not tied to any Western church or denomination. 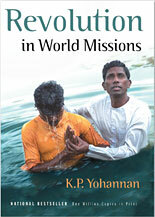 Native missionaries desperately need our prayers. They constantly battle attacks of Satan through discouragement, illness, and actual physical harm from anti-Christian forces. Prayer is an absolute necessity to protect native missionaries and to insure the fruitfulness of their work.